When was the last time in past 5 months you’ve used Instagram without checking stories? – Hard to remember, right? 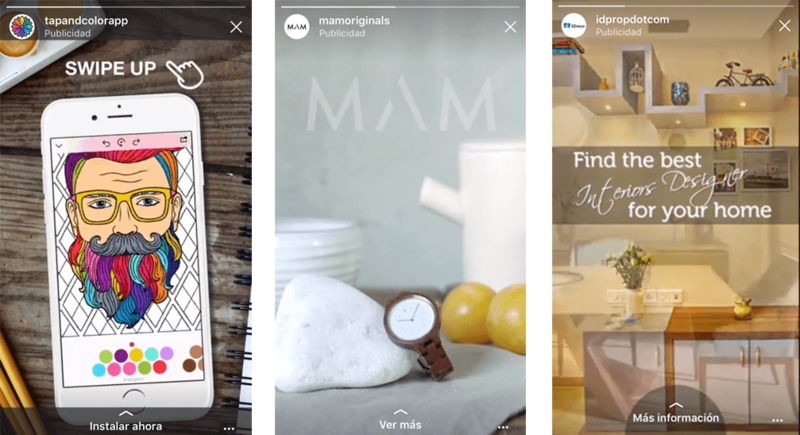 Well, Instagram stories have been super-hit and users are making the most of it, and now, Instagram stories ads are taking over! Instagram currently has around 800 Million users, out of which, the last 100 Million have been added in last five months. That shows the pace of growth of the app and it clearly signifies the importance of Instagram in the lives of social media users and the digital marketers. Instagram Stories Has More Than 250 Million People Using It Every Day – Around 60 percent of total Insragram users access stories every day! There are 2 Million brands advertising on Instagram. 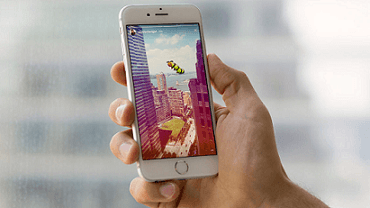 Instagram Stories have resulted into 15-40% decline in Snapchat stories. Instagram is the second most popular social media app after Facebook and with its success with Stories; it is even taking over Snapchat. A study shows that Snapchat stars post 25% more content on Instagram stories now. That makes Instagram a mighty player in social media marketing scene and the stats mentioned above highlight the perks of Instagram stories ads. As you scroll through the stories on Instagram, you might have notice some stories by brands. They talk about their products / services in an interesting way that it’s hard to notice that those are ads which take you to the landing page of the brand. They have a ‘sponsored’ tag on top of them. Basically Instagram has gauged the popularity of the stories feature, and people love it. So let’s start creating ads in stories! If you’ve never set up ads on Instagram, you must know that you need to have an Instagram business account which is linked to your Facebook brand page. You can visit here to know how to do it and the perks of switching to the business account. First of all, decide the objective. Have and understand your goal for running an ad in the stories. Is it for better reach, more conversations, more product / service showcase? What is it? Don’t run these ads just because your competitors or people around you are doing it. (Well, on a serious note – don’t do anything just because others are doing it) Once you have a goal, it would be easier for you in many aspects of the campaign – right from ideas to results of the campaign. 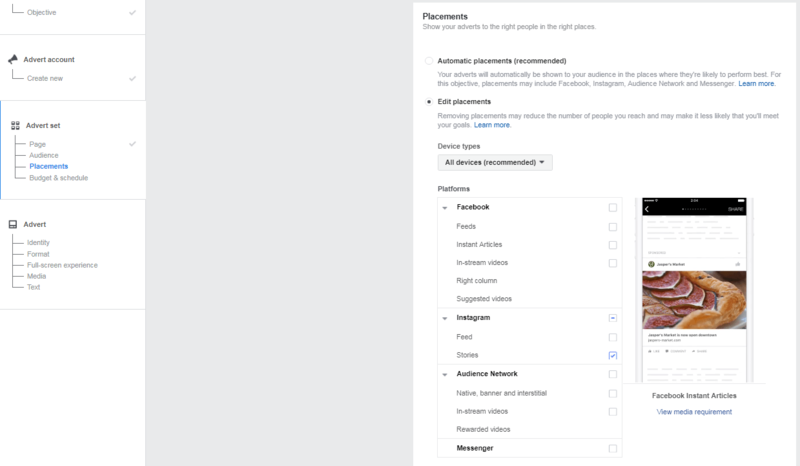 Go to Ads Manager on Facebook. Click on Create Ad on the top right corner. 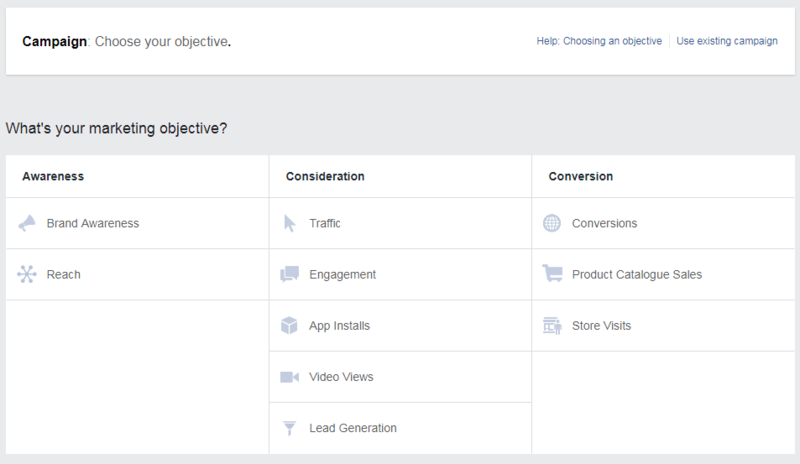 Choose an objective of the campaign – Traffic / Conversion / App installs, video views, etc. 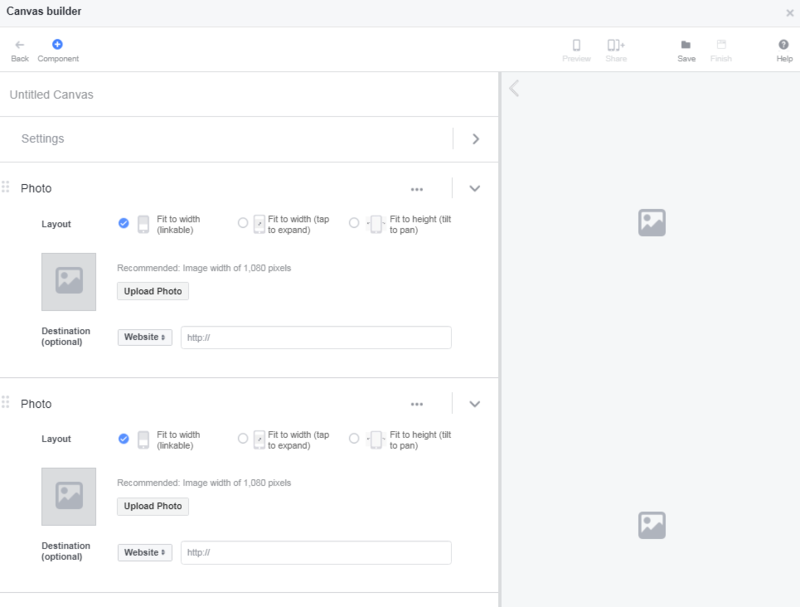 Keep in mind that you can use Facebook’s custom templates and Canvas option for ads in Instagram stories. Name the campaign and continue. Choose the audience that you want to target. Here, you can use audience set from ‘Use a saved audience’ tab if it matches the objective of this ad campaign. If not, you will have to create a new set. Click – Save this audience. 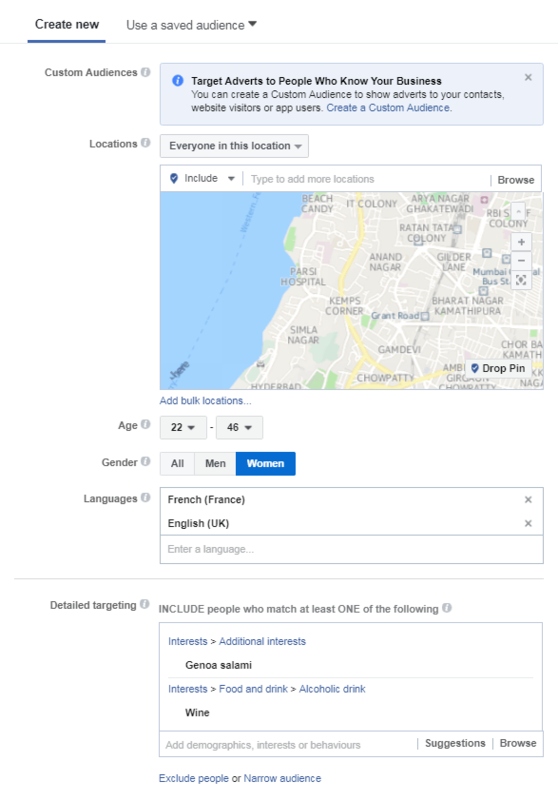 Next section is placement – Here, Facebook suggests a placement which it assumes is suitable, based on the algorithms. But for this campaign, click on Edit Placements. Under the platforms tab, select Instagram and tick on the Stories box. Enter the details about budget and scheduling. Be sure to check your Instagram analytics before placing an ad. The active time / peak hours for Facebook and Instagram may vary. Select accordingly. 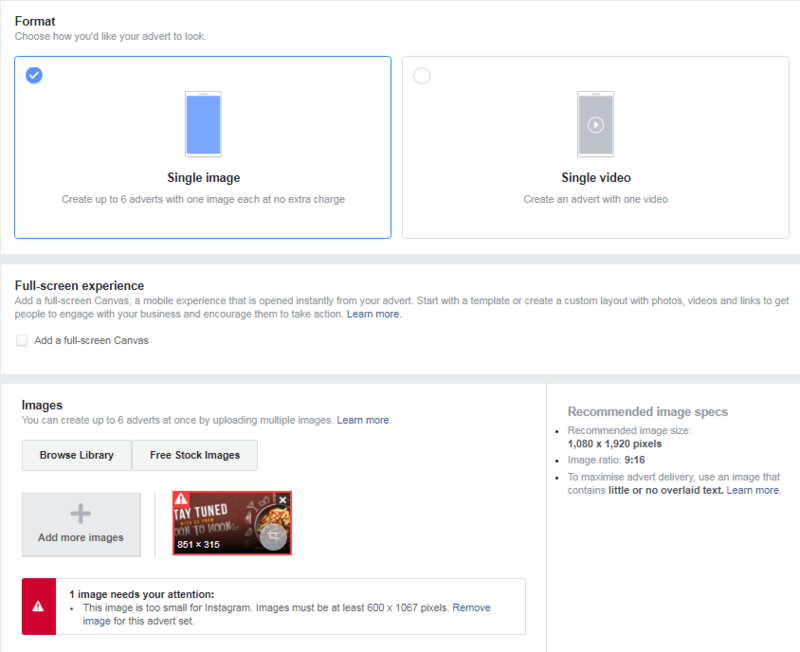 Connect your ad to a Facebook Page and an Instagram account. Select an ad format – This depends on what kind of media that you want to showcase as a creative – Single image / single video / carousals etc. In Instagram Stories ad, you can choose to create a Canvas with customised images, videos, audio, and so on. Note – A Study has shown that 70% of Instagram stories are watched with sound on, as opposed to Facebook videos. So make sure you add relevant audio to your add. This also makes provision for lesser text. Check on a box to Add a full screen Canvas. This will take you to a Canvas builder. Give name to your Canvas, select the components you want to add and how you want them to fit a mobile screen and click Save. Under Settings, turn on the Support Instagram option and click finish. 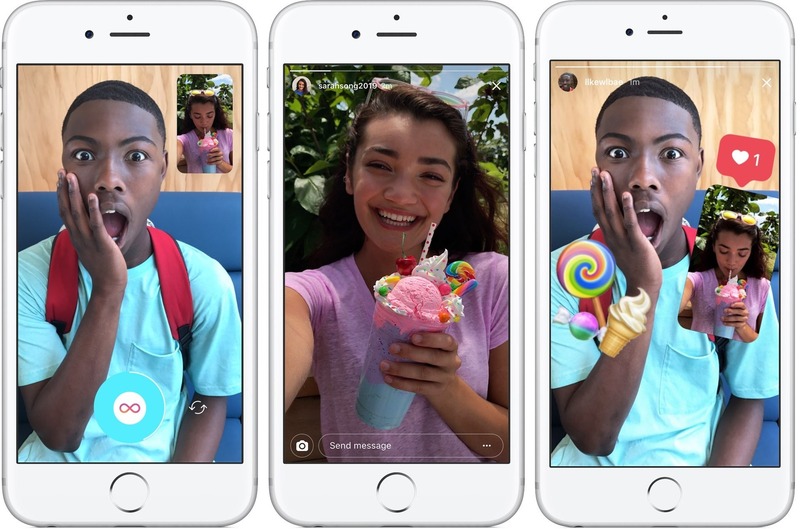 Here’s a thing – According to the latest announcement by Instagram – if you are advertising for your brand and choose to use your actual Instagram stories, you can add face filters, boomerang videos, doodle on the picture / video. We totally recommend it because it creates a native look and feel to the ad. i.e. – the user will look at it as another story (with a take away) rather than ad. Plus, it’s always a great idea to use authentic content which is relatable for your audience. Instagram stories are preferred by the users, they give a feeling of tightly knit community to the brand followers and stories are not fully commercialised yet. So why not place your next ad in Instagram Stories? Moreover, according to the statement released by Instagram, ad recall from Instagram ads was 2.8 times higher than Nielsen’s norms for online advertising. Need we say more?